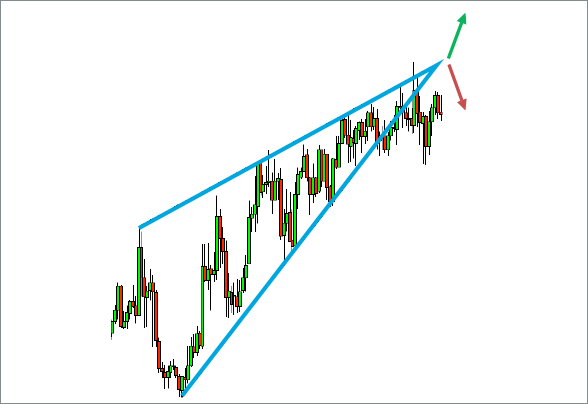 What are Falling and Rising Wedges? Rising wedges occur when both the slope of the lows and the highs is rising. The slope of the lows must be steeper though, so that at some point it forms a point with the slope of the highs. Falling wedges occur when both the slope of the lows and the highs is falling. The slope of the highs must be steeper though, so that at some point it forms a point with the slope of the lows. Why are Rising and Falling Wedges important? 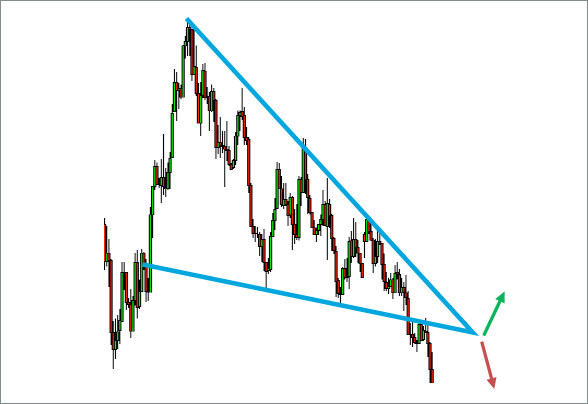 Wedges imply that the market cannot decide whether to break up or down. Once the flag is broken by the price, there may be a substantial move in the direction of the break. Flags can be used to interpret large breaks in price. If the price breaks through the flag to the downside, there may be a large move down. Similarly, if the price breaks through the flag to the upside, there may be a large move up. However, usually price breaks in the direction of the wedge. We may use these to help identify trend or to confirm a Gartley or butterfly pattern.